Dry cured, hickory smoked bacon from Virginia. Sam Edwards and his family have cured hams and this bacon for three generations in Surrey, Virginia. They start with full slabs of heritage-breed Berkshire pork, hand rub them with salt and sugar, then leave them to cure for ten days. Dry curing is rare in bacon making, which is kind of a dying art. Most modern bacon makers "wet cure" their bacon. Wet-cured bacon comes out of the smoker at about the same weight as it goes in. (Note: "wet cured" is different than "water added," which many poor quality, commercial bacon makers do to increase the weight and price.) 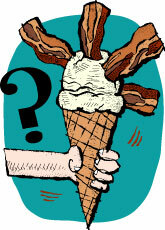 Dry-cured bacon loses at least 10 percent of its weight, but its flavor intensifies. After curing, the salt and sugar are rubbed off, and Edwards' bacon is smoked for 18 to 24 hours over green hickory. The flavor is very rich, very deep, with special thanks due to the excellent heirloom pork. Sweet and smoky at the same time, it’s as terrific for eating on sandwiches as it is for flavoring dishes. Render a diced slice in the pan next time you cook onions, greens or beans. The fat that runs off is a great alternative to butter or olive oil. Plus you can nibble on the crispy bits while you're finishing the dish, a cook's reward for taking a small, delicious extra step. Sometimes this old-fashioned bacon has a rind on one side. You can trim it off with a sharp knife before you cook it. In January 2016, the Edwards Smokehouse burned down in a huge fire. Our hearts go out to the Edwards family and their whole team at this difficult time. They're working toward rebuilding their operation, but in the meantime, we don't have an ETA for when we expect to have any of their meats available again.